The ability of Biomolecules to work as switching devices in computers is a major area of research in the present day with the invention of some bacterial proteins which functions exactly similar to the electronic switches. These Molecular switches increase the possibility of fast random access and transportability of datas in Multimedia systems. If these are used in computers, appreciable amount of size reduction, fast memory access, mass storage of datas etc can be achieved. 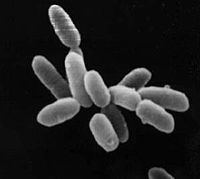 The invention of the light sensitive protein Bacteriorhodopsin from the Halobacterium salinarium has generated great interest among scientists to use it as a Molecular switch.